Crooked Lane Books, 9781683316206, 288pp. You find out who did it on the very first page. On the last page, you'll find out why in this expertly plotted, "enthralling" (J. P. Delaney) psychological suspense novel from an internationally bestselling author. Just one hour later, the attacker, J. P. Carney hands himself into the police and confesses to beating Harry to death. Except he also claims that the assault was not premeditated and that he didn't know the identity of his victim. With a man as notorious as Harry McNamara, who was just found innocent in a highly sensationalized fraud trial, the detectives cannot help but wonder: Was this really a random act of violence? Was Julie really powerless to stop JP? When Harry's many sins are unveiled to include corruption, greed, and betrayal, nothing is for sure. This gripping psychological thriller will have you questioning, who--of Harry, Julie and JP--is really the guilty one? And is Carney's surrender driven by a guilty conscience or is his confession a calculated move in a deadly game? 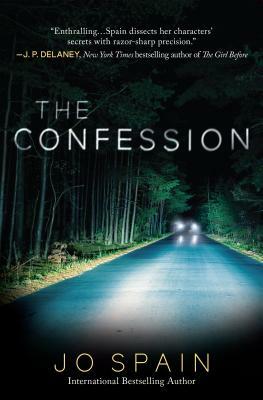 Brilliant and ice-pick sharp, The Confession is perfect for fans of B. A. Paris and Fiona Barton. Jo Spain is a full-time writer and screenwriter. Her first novel, With Our Blessing, was one of seven books shortlisted in the Richard and Judy Search for a Bestseller competition and her first psychological thriller. The Confession, was a number one bestseller in Ireland. Jo co-wrote the ground-breaking TV series Taken Down which first broadcast in Ireland in 2018. She's now working on multiple European TV projects. Joanne lives in Dublin with her husband and their four young children.